How nice it is to go back to a favourite restaurant; somewhere where one knows in advance that the food will be good, the staff will give a nod and a smile of welcome, and the chef/patron will pop out from the kitchen to shake one’s hand. 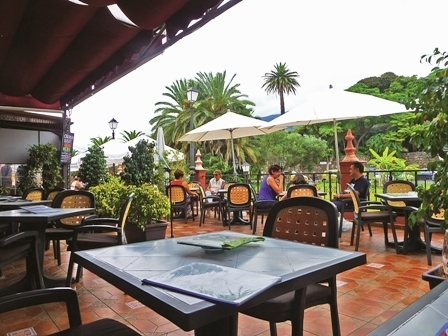 16.09.2015 - Such a place is Terraza del Botánico, where Julio, the chef/patron plies his trade. In a line of competing eateries directly opposite the entrance to the famous Botanical Gardens in La Paz, Puerto de la Cruz, you have to do things a bit differently to stand out from the crowd. For me, this is the reliability of the offer and the friendliness of the welcome. We often pop in for one of the famous monster burgers at lunchtime. You can choose between black Canarian pork or beef, and I am sure that you will not get a better one anywhere in Puerto. Costing €9.50 they come with a heap of salad garnish and the ubiquitous French fries. Salads, too, are splendiferous. A chunk of salmon that has been smoked, a mixture of leaves, some fruit (a little odd that, but no matter) and the usual salad accompaniments make for a plate for a trencherman, all for €11.50. Today Julio rushes out to suggest that we try his new soup, just ready on the stove. Soup? On a hot day like this? We are seduced by his cheery smile, and very soon a large bowl of his home-made chicken broth arrives. In addition to the large chunks of tender chicken, there are carrot, celery, mushrooms aplenty, beans and lots more. The heaped bowl is enough for two; it is bursting with flavour and we demolish it with gusto. Julio is branching out with some special offers, and they seem to attract a good regular clientele. Tonight he will be hosting an Andalusian themed evening. His young waitresses will be decked out in traditional flamenco dresses, all red and black with a multitude of flounces. Balloons and buntings are being interwoven across the parasols. All the tables, inside and out, are booked in advance for these special events. He tells us that there will be three starters (you get all three, not a choice of just one) consisting of cold cuts of Ibérico meats, home-made gazpacho, and prawns from Huelva (the best and most succulent). Main courses are to be hot Ibérico pork with a red-wine gravy or a thick slice of fresh tuna, seared just so. Both will be served with appropriate vegetables. And to finish, if you have room, a selection of desserts. But back to the day-to-day offerings. Do you want to start with home made croquetas (€5) or ensaladilla of prawns (€5.50) or a choice of very tasty Montaditos (€5)? If that sounds expensive for a Montadito, believe me that it is not; they come with pate, or brie or fillet steak, all garnished. There is a whole section devoted to different salads, and pasta and fish feature strongly. I have previously enjoyed a large dish of the tagliatelle with salmon and prawns (€8.50). Or, of course, you might opt for fillet steak or chicken in various guises, usually with a twist. Portion sizes are generous. Wines? Yes, there is an excellent list, with the peninsula featuring as well as a goodly selection of local ones. Perhaps the house wine needs a little work on it, though. Morning coffee, just an ice cream, lunch (a kids menu is on display), or a full blown dinner? The choice is yours and you will not be disappointed. Open: 12 noon to 11 pm.